Is there a deliberate effort to cover up some extraordinary artifacts that were found in what some think was Alexander the Great’s grave? Baghdad Djillali Difallah, a French treasure hunter of Algerian origin discovered these remarkable and very beautiful ancient objects in a cave in Jordan. The cave that extends tens of meters leads to two large halls covered with golden objects. In one of the halls there is the ark of the sarcophagus of Alexander. Could this be the true location of Alexander the Great’s grave? The location of the cave is being kept secret by the Jordanian government. There are some rumors the cave was known and guarded by a secret unknown organization, preventing the outside world to learn about these incredible objects. However, Baghdad Djillali Difallah feels it is important to reveal the truth about this discovery to the public. “It’s been three years since I carried this burden, it frees me that the whole world knows, it was time for me to reveal it. I am relieved to have made public my discovery; it was buried deep in me as an archaeological relic. But this treasure belongs to the heritage of humanity,” Baghdad Djillali Difallah said. According to Baghdad Djillali Difallah this is the greatest archaeological treasure of all-time. Although the treasure hunter found the grave in 2011, it took two years for the news to be disclosed and finally made public. The announcement took place on 25 July 2013, at the Institut du Monde Arabe in Paris. Baghdad Djillali Difallah held his first press conference to reveal his incredible discovery. On two occasions, in particular, equipped with an oxygen mask and a makeshift lamp, Bagdad Djillali Difallah expressed his “indescribable emotion” when entering the rooms where the treasures were lying after walking through incredible corridors. “How amazing it was to be suddenly facing the golden sarcophagus decorated with a royal ready to take off eagle. I was there after years of expectation of this fabulous moment,” Baghdad Djillali Difallah recalls. It is now up to Jordanian authorities and the King of Jordan to reveal the content of the tomb and tell the public about this remarkable discovery. The problem is that many Jordanians are upset over the corruption as many priceless ancient treasures have been sold and looted in the past. What will happen to the wonderful objects discovered in the secret cave? Will they mysteriously vanish or will they be properly examined and one day admired by the public? Baghdad Djillali Difallah still hopes that Jordanian archaeologists will organize excavations conduct investigation of the object in order to determine their date and true origin. But, upon entering the chamber, the archaeologists may have damaged the structural integrity of the surrounding structure – and are concerned it may collapse before they discover what lies beyond. The dome structure has been weakened, as a result of losing a large amount of earth, and the researchers found the arched dome of the third chamber is on the verge of collapse, due to ‘deep and extensive cracks’ on either side. But the discovery of the female sculptures gave fresh hope that some treasure may have survived, after all.The Caryatids are made of marble and support an inner entrance into the tomb.They feature the same sculpting technique used for the heads and wings of two sphinxes found guarding the main entrance of the tomb last month. 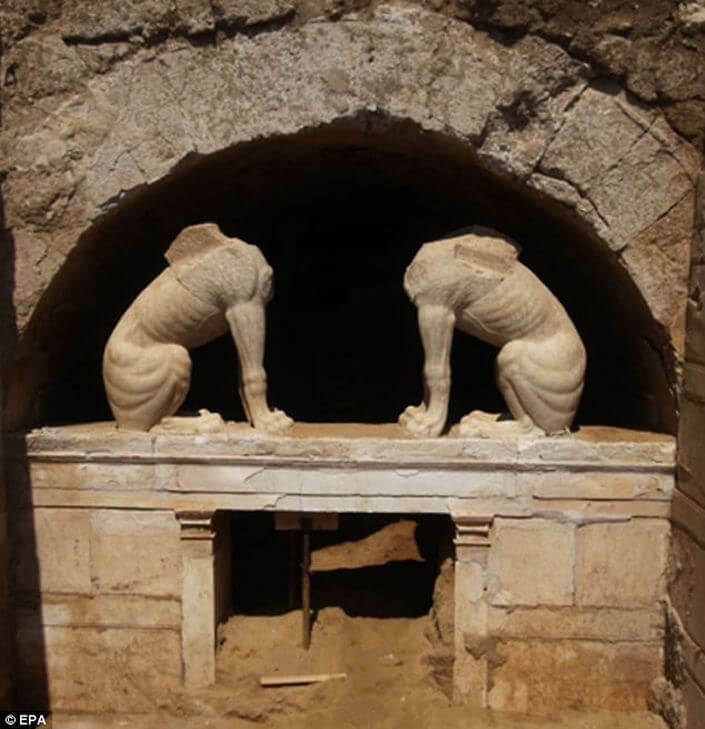 Last month, pictures emerged of a pair of sphinxes guarding the grave’s main entrance beneath a large arch and experts said that most of the earth around the mythical creatures had been removed to reveal part of a marble lintel with frescoes. Archaeologists were hopeful that an ancient mound in northern Greece could hold the remains of a senior official from the time of Alexander the Great. They discovered that its entrance is guarded by a pair of sphinxes (pictured) but last month warned that signs of forced entry indicate it was plundered in antiquity.